we're experiencing some warm humid weather in southern CA today and it's making me think of hawaii, the beach and anything tropical. this is a nice light dish, simple to prepare and easy to impress. 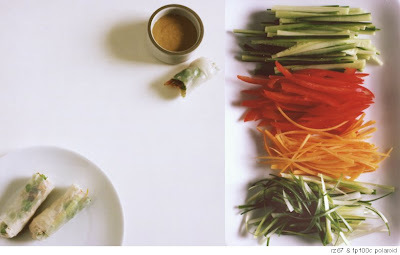 there are plenty of fried spring roll recipes out there, which i consider an egg roll, but these vietnamese spring rolls use tapioca sheets and plenty of fresh crunchy vegetables. they are easy to make ahead of time and keep in the fridge wrapped in a damp paper towel until you're ready to eat. rolling takes a bit of practice but once you get the hang of it, it's a lot of fun! in a small saucepan, combine chicken breast with coconut milk, lime leaves and 14 oz water. bring to a boil, reduce to a simmer and cook for 20 minutes or until chicken is cooked. cool completely and shred. fill a large rimmed sheet pan with 1/4-inch warm water and dip 1 tapioca sheet in the water for a few seconds until it softens. carefully lay wrapper flat. in a row slightly below center and about 1-inch from the sides, place a small handful of chicken. then layer with a few strips of bell pepper, carrots, cucumber and green onions and top with a little of the greens and cilantro leaves. bring bottom of wrapper up and over filling, then fold in sides tightly and roll upward until sealed. repeat with remaining ingredients and sheets and slice in half with a sharp knife. serve with dipping sauce. this seems delicious... does it transfer well into a curry? I used to make fresh spring rolls at least once a week when I was a single gal. It's time to rekindle my love for them with this recipe!